Above is a pic of the test fixture with adapters (in this case on a AA-600). Above are the OPEN, SHORT and LOAD components intended for SOL calibration, the left hand one will be used for the cable measurement. The problem is that these adapters all represent some significant propagation time that needs to be factored out of the measurement. Antscope has a feature to back out a length of transmission line, we will use that. This is not as accurate as SOL calibration, but it is a useful technique when SOL calibration is not available or convenient. The O test load (the pair of open machined pins is plugged into the adapter, and a scan taken. 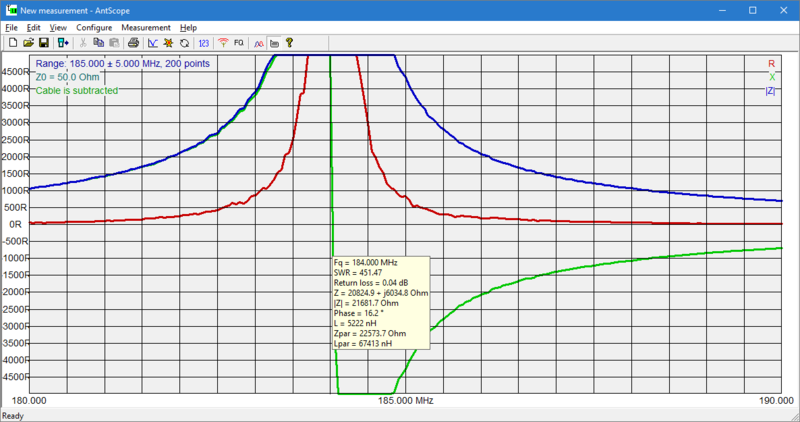 The scan shows some residual shunt capacitive reactance (viewed in Zpar mode) which is due to the test fixture. We can approximately back that out by using the subtract cable feature, adjusting the length for maximum Zpar. The cable backout adjusts for the 280ps propagation delay and Zo and resulting impedance transformation from the instruments calibration plane to the fixture’s measurement plane. 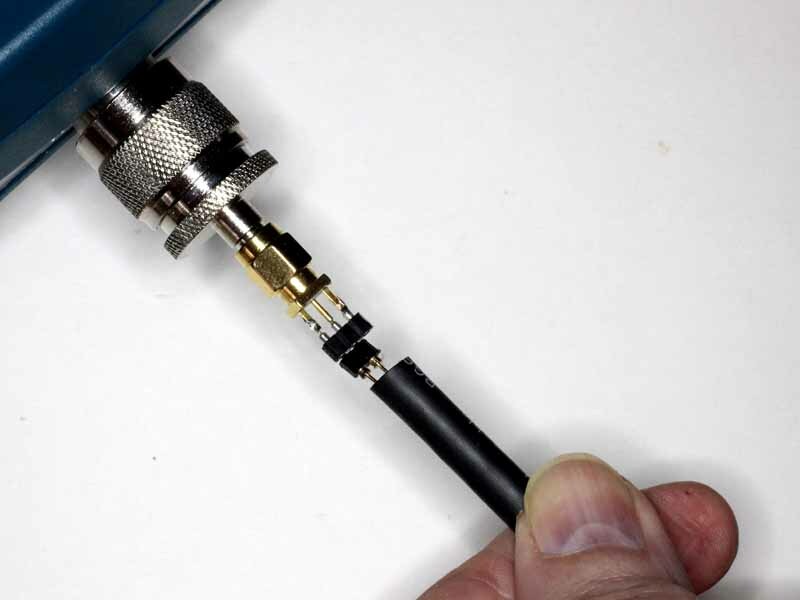 Measuring balun common mode impedance gives a more detailed procedure for backing out the test fixture. The prepared cable end is carefully pushed just 1mm onto the pins to connect the inner and outer conductors to inside and an outer pin of the adapter (as shown earlier). The DUT is scanned in search of the consistent sensible first half wave resonance, In this case 184.000MHz. A half wavelength in free space h0 at that frequency is found by dividing c0 by twice the frequency, so h0=299792458/184000000/2=814.7mm. 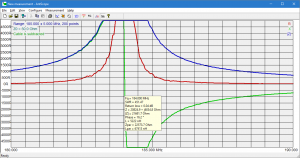 Velocity factor is found by dividing the DUT length by h0, vf=661/814.7=0.81. 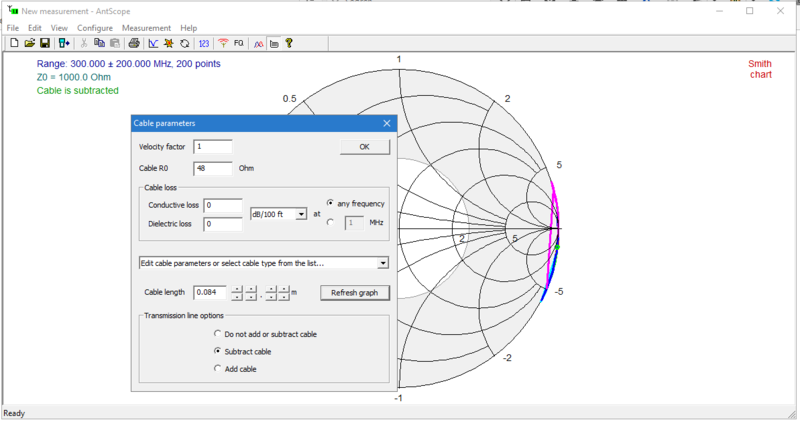 Now that length can be used in designing tune line lengths such as phasing lines etc. 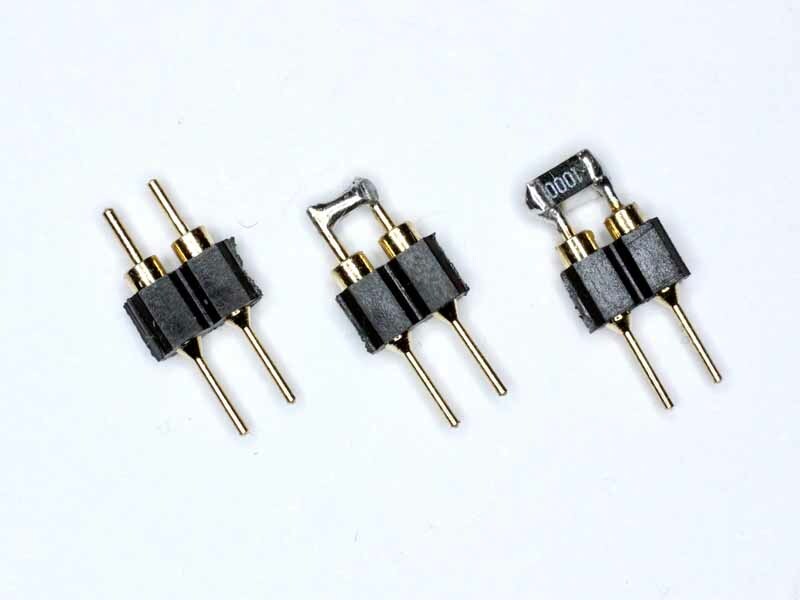 Do not ignore the effect of connectors in such applications. 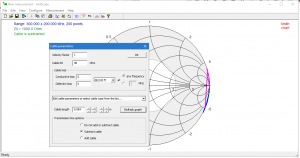 By all means, design and use your own fixtures but be aware of any change to connection lengths to the DUT that will invalidate the calibration. attempting to measure sample line sections with connectors on them of unknown electrical length, and worse, ones of unknown Zo as well (eg UHF connectors) can introduce significant error.